I knew this could be a major storm day, probably to just to the south of our area. ETA was forecasting energy helicity index above 8, and various models predicting LI of -6 to -8. Although there was some disagreement over how far north or south the greatest instability would be, all placed it along the Mississippi river near or southeast of St. Louis. SPC put out a high risk for southern MO and parts of southern IL. An outflow boundary from storms early in the morning was strong enough to be easily visible on satellite photos, running generally east-west to the south of the St. Louis area. And as all this was happening, a strong jet max was approaching from the SW. I knew the action would be close, probably just to my south, so I waited at home and watched to see what would happen. By around 3:30, my strategy was becoming evident, based on a single supercell (which was eventually followed by another) that formed southwest of St. Louis and moved due east. I headed down I-55 and I-255 from Edwardsville, leaving around 4:00. I had been watching the above-mentioned supercell move eastward from Osage Co., MO toward Franklin Co., MO on TWC radar before I left. This would take it to somewhere near the boundaries of St. Clair and Randolph Counties in Illinois, if it continued this motion. Thanks to a couple radar updates from Chris Novy, I knew that this motion was continuing so I took IL route 3 from I-255 to Red Bud, spending what seemed like an eternity stuck in traffic in Waterloo. Finally I reached Red Bud, and as I approached the outskirts a tornado warning was issued for that area based on a radar indication of a tornado near Hillsboro, MO just across the Mississippi River. I headed a little south of Red Bud on route 3 to find a place to watch and wait for the storm. I was in position about 3 miles south of Red Bud, which appeared as best I could see to be east of the storm with a good escape route south, by around 5:30 or so. Around this time another tornado warning was issued based on a radar TVS near Maeystown. As the storm moved toward me, I saw a beavertail on the northeast of what turned out to be the updraft base, extending northeast toward the precipitation area. As the RFB approached me a huge wall cloud became evident. Here is a video snap of this feature, and here is a photo. Some of this lowering was due west of me, so I backed maybe 1/3 of a mile farther south. At that stop - about ten to 6:00 - I saw and videotaped a huge rotating wall cloud that extended almost all the way to the ground (appeared to go all the way at times) and at one point appeared to throw up a cloud of dust or debris - I saw it at the time and can see it on the video. 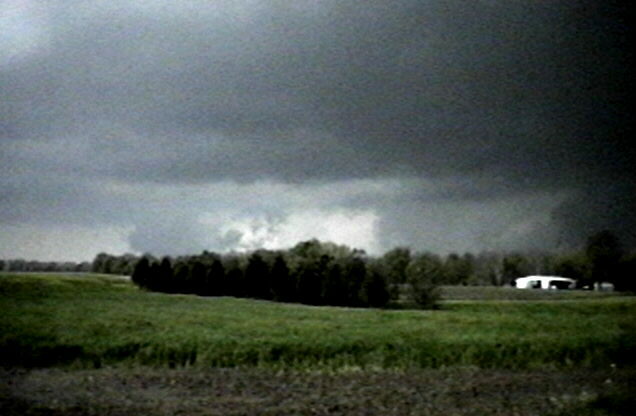 This may in fact be dust or debris, indicating a tornado, or it may be very low scud or hail fog being drawn into the vortex. 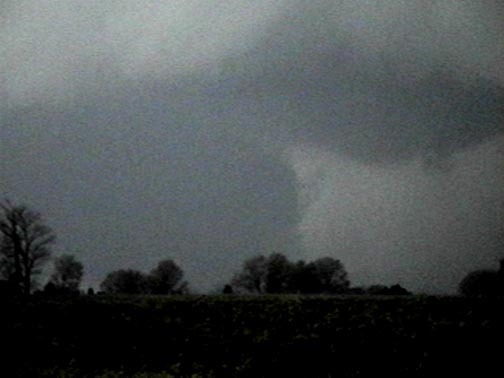 Jay Antle was viewing this lowering from the north and reports seeing hail fog drawn into it. Whether that was at the same time as I was seeing this or slightly later is not clear. 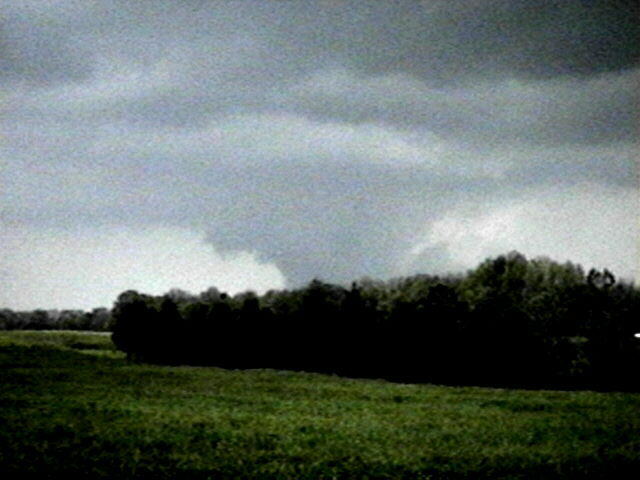 He felt that when he saw the lowering, the wind strength was not strong enough to classify as tornadic. There is also a flash of light - looks like a power flash but could be lightning - in my video at one point in the location where the lowering is closest to the ground. At about this same time there was a spotter report of a tornado near Red Bud, which prompted a warning from STL NWS. (Actually, there were reports of brief touchdowns both west and east of Red Bud.) On the NWS STL local storm report a tornado is reported as briefly touching down 10 miles SE of Waterloo, which would place it about 3 miles W or NW of Red Bud. I was about 3 miles S. of Red Bud looking NW. Based on the possible debris, possible power flash, spotter report, and minor damage I later saw (discussed below) I am classifying this as a "possible tornado," but I would like to emphasize that I am not completely sure about this. 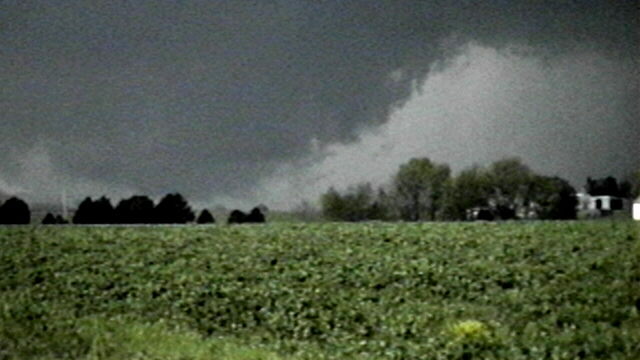 Severe storm spotters reported a brief tornado in open country south of Waterloo. Spotters reported golfball size hail. The location reported above - 10 miles SSE of Waterloo - would place the tornado reported by spotters almost exactly in the place I was looking at - about 4 miles WSW of Red Bud. Additional notes: The second touchdown in the preliminary LSR, reported at the east edge of Red Bud, does not appear in Storm Data . This second touchdown may have been discounted. Also, the largest reported hail associated with this storm in Storm Data is 2.75 in. - somewhat smaller than reports of 4.5 in. in some locations that appeared in the LSR. The most zoomed shot. Note there is something rising into the vortex from the ground at the lower right. Is it dust/debris, or is it scud or hail fog? Seeing more lowerings to the left of this one I moved south again, to the north edge of Ruma. 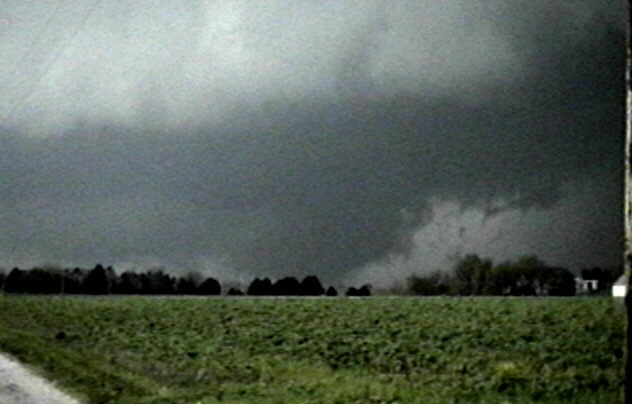 There I taped 3 more large lowerings that passed near or just south of Red Bud, as the Ruma tornado sirens blared. Pretty dramatic video! Shortly after arriving at the edge of Ruma, I got a chilly blast from the NW - RFD from the meso that had passed just to my north. This may have undercut or weakened the other lowerings that were still to the west. After a few minutes of RFD the wind went dead calm. 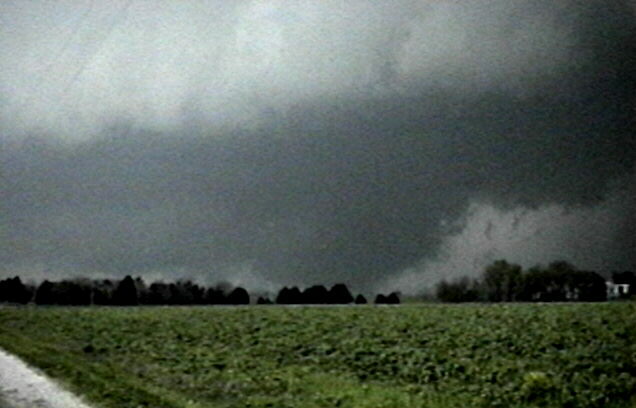 The Ruma sirens were activated after two rapid-succession tornado warnings, the first after a TVS was noted just west of Red Bud and the second after the spotter report noted above. And imagine seeing this while the sirens blared! This is NOT a tornado. 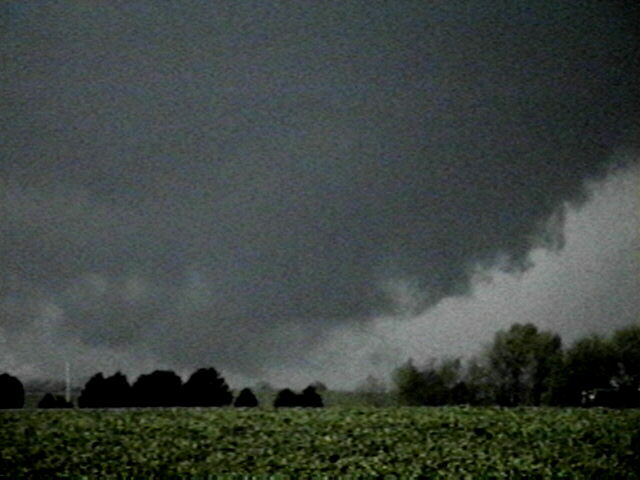 Although it looks like a large wedge and I thought it was at the time, it was either a wall cloud or a wide funnel. 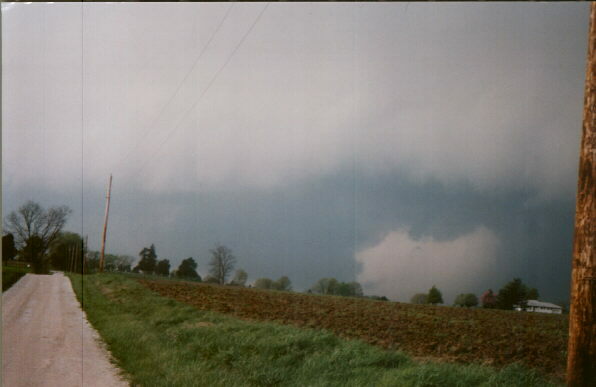 Shortly later when I felt safe to move back north, I could see that none of these lowerings reached the ground, and there was no report of a tornado at the time I was observing them. After the storm passed Red Bud it appeared to temporarily weaken or go outflow dominant. I went back to Red Bud to see if there was damage. All I saw was a cemetary at the west edge of town where 4 large trees were down and a lot of branches thrown around. I drove through a subdivision to the south and past a trailer court to the west and saw no visible damage, though people were out pointing to the sky. A KMOX reporter who heard of damage at a trailer court checked it out and found only a few awnings blown down. However, I later found that the trailer court I looked at was not the one where the damage occurred, and at that one, newspapers reported one or two trailers unroofed. Both the KMOX reporter and a St. Louis helicopter crew reported ground deeply covered by hail north or northeast of Red Bud - I saw the copter video at 10:00; pretty dramatic. The Post-Dispatch also had a photo of hail along route 159 north of Red Bud. This hail, which I did not see, was up to golfball size; other areas got up to 4.5 inch diameter hail. Somewhere between 6:30 and 7:00 - not sure of exact time - I headed ESE toward Sparta on route 154. A TV radar loop I saw later confirmed my visual observations at this time that the storm turned NE somewhere east of Red Bud then morphed into a squall line. I watched this happen as I caught up to a flanking line extending southwest of it between Red Bud and Sparta. I had decided to go over to Sparta 1) to see if anything developed on the flanking line and 2) to avoid driving through a reported hailer moving into Monroe County. As the flanking line looked fairly innocent I crossed under it and went north on route 4 at Sparta. I did notice a somewhat wimpy lowering north of Sparta as I approached Sparta from the West. This feature had moved east by the time I reached Sparta, however. There was also another larger lowering off farther to the east but I lost sight of it in the darkness and poor contrast. Then in the next 15 minutes, as I headed north, everything intensified, a tornado warning went up on the cell NE of Sparta, and the whole flanking line evolved quickly into a squall line, that pounded me with torrential rain and a little hail. There was water on the road in places from flash flooding in nearby fields near Marissa. This would have been around 7:20. I saw a number of low ragged clouds that seemed to form along areas of intersection of inflow and outflow, with lots of CG zapping down all around me. Another tornado warning went up for a storm to my west, but I knew that since I was well due east of the eastward moving meso and headed north that I would be out of the area before it arrived. I picked up route 15 east of Fayetteville and followed it to Belleville to pick up I-255 and return home. Rain continued quite heavy all the way to Belleville, with decreasing lightning after Fayetteville. I was back in Edwardsville around 8:30. Total chase distance: about 150 miles. Here is a map showing where I photographed the possible tornado and where the spotter report of a tornado was. Here is a series of radar images of the storm, including one from the approximate time I witnessed the possible tornado. A TORNADO NEAR HILLSBORO MISSOURI... MOVING EAST AT 25 MPH. THIS IS A DANGEROUS SITUATION! IF IN THE PATH...TAKE COVER NOW! INDICATED A TORNADO NEAR MAEYSTOWN IL... MOVING EAST AT 25 MPH. AROUND YOU MAY DEPEND ON YOUR ACTIONS. A TORNADO JUST WEST OF RED BUD IL... MOVING EAST AT 25 MPH. REDBUD... MOVING EAST 25 MPH. CONTAINS ADDITIONAL REPORTS AND SOME CORRECTIONS TO PREVIOUS REPORTS.